Anyway, the other part of my stress was that my guest speaker for tomorrow needed to cancel last minute because she got a call that her mother was dying and probably wouldn't survive the next few days --and she needed to leave town. I felt so bad for her for what she is going through right now--I never know what to say for things like this. This did stress me out too because I needed to develop another lecture for tomorrow while still trying to put in finishing touches with the rest of the course! Anyway, I feel bad for her for what she was going through, I can't exactly imagine since my mother is still alive (and do not even want to think of when she will leave us!) so I made her this card I am featuring today. 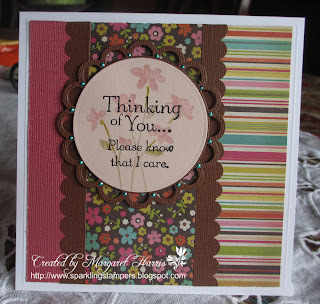 I will be entering the card to My Time to Craft Challenge: #230 Sympathy. I was pretty happy to find this challenge because the design team and the challenge participants have made some lovely cards for sympathy. I always struggle what to create for sympathy cards--and if you go to their blog, you will find some nice inspirations. I really didn't want to create anything black...death after all has been a time to celebrate a person's life for many centuries in many cultures. And since this person's profession is with plants, I thought this theme was a bit more appropriate. I love the pastel flowers in the background of the sentiment. Quite lovely! Im sure your friend will appreciate your thoughtfulness!!! Gorgeous creation, love the papers!